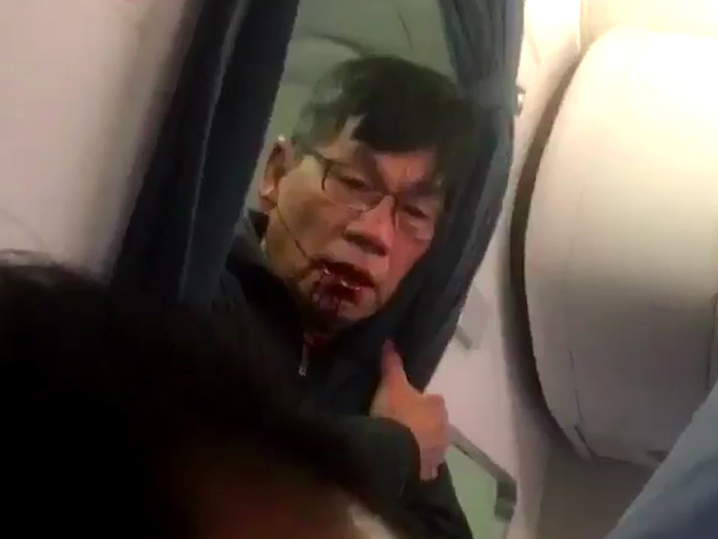 TMZ’s picture of Dr. Dao post-beat down. long article here. A few moments ago, the attorneys representing Doctor David Dao held a news conference. For those joining us late, Dr. Dao was engaged in the criminal activity of taking a United flight from Chicago to Louisville when the Airline decided they needed to free up four seats for their employees. Dao was originally willing to leave, but changed his mind when he found out he would miss work the next day, including planned surgery for patients. United found this unacceptable, and called out the police to drag him off the flight. Some other thoughts: As far as I know, Dr. Dao was breaking absolutely no law by demanding to remain in his seat. He had heard what the airline was offering for his inconvenience and had a change of heart. So one has to ask–why would this have become a police issue? It seems to me that whoever was in charge of the police should’ve listened to everybody’s side of the story and then calmly turned to the United manager on the scene and said “this sounds like a personal problem” and gone on his way. Somebody managing the Chicago PD should answer a few good questions about why the cops felt empowered to beat the crap out of a paying airline customer. UPDATE: I’m told that an airline has the right to demand your seat away from you. Okay. what conditions apply to that if you don’t wish to comply? The good Doctor had patients waiting for him. Is it a felony to not comply? If not, wouldn’t the treatment he received from the cops be considered non-judicial punishment? A larger issue (one that came up during the days of Occupy Wall Street): who’s in charge of the cops in these circumstances? The NYPD has had numerous officers rented out for ‘paid detail’ to protect sports venues and bankers and hedge fund guys. Once assigned, the cops’ supervisors (i.e., bankers or venue managers) decide what’s legal. Question: what other kinds of enforcement are officers ‘rented out’ to commercial enterprises allowed to carry out? Why should the good taxpayers of Chicago have to pay for police to enforce an airline’s position in a customer service dispute? Here’s hoping the case doesn’t get settled with a non-disclosure agreement. Policing in this country is broken.